Zettex Easycontact S10 is a quick-drying universal contact adhesive applied using a brush or roller. 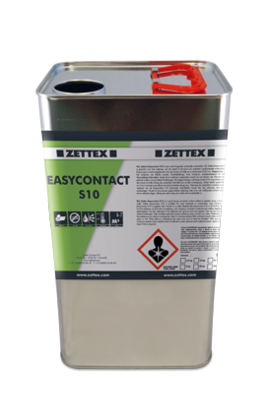 Zettex Easycontact S10 is suitable for most materials in construction and industry. This Easycontact S10 is applied with a brush or a roller. Besides the Easyontact S10 is DCM-free. • For the adhesion of all kinds of carpeting, cork, linoleum, insulation material and rubber. • Dry the materials to be adhered and remove dust and grease. This can be done with Zettex Profireinger. Then carefully apply the contact adhesive using a brush or a roller. Preferably apply the adhesive rows without overlapping. After 2-4 minutes adhere both surfaces to each other and firmly press or roll. When there is overlapping the open time must at least be doubled. With very porous surfaces carefully check whether there is sufficient contact between both adhesive layers. Apply an extra layer if this is required.